This has been a long term goal. My 1000mm newtonian with SC3 does not give a very good image scale on objects like the Ring Nebula. I finally tried to image this object with a 2x barlow. The L layer was captured using the barlow - giving an image scale of about 0.66 arc sec per pixel. The colour images were taken without the barlow. Sort of like binning! ;-) I used some slight wavelets in registax on the L layer, which has resulted in an increase in noise inside the ring. Looking back I have found this image taken of the ring nebula with my SC1 last year. Also compare this image taken at prime focus with my SC3. THe star shapes are not great, but perhaps as good as I can expect at this focal length and my less than ideal LXd55 mount. 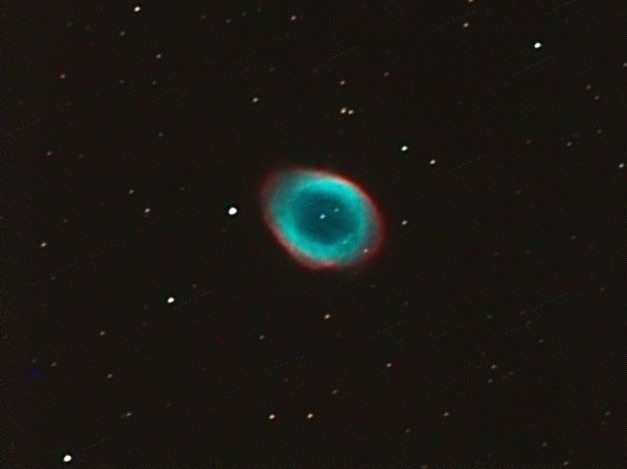 I always find M57 very hard to process - its extremely easy to merrily play around with the curves and find you have saturated the highlights of the ring. Almost no processing is perhaps the best approach. Here is a history of my images of M57. I have also produced a slightly brighter version - your monitor will dictate which one you prefer. Captured in k3ccdtools, stacked in registax v3. Coregistered and balanced in IRIS. Combined and processed as LLLRGB in photoshop. Gain on the L layerwas about two thirds.